OptaPlanner - How good are human planners? How good are human planners? Are we smarter than machines when it comes to planning? Or can automated planning beat humans? I did an experiment with a group of innocent software engineers. These are the results. During my last 2 deep dive trainings, I asked the attendees to manually solve a simple planning problem, to introduce them to the difficulty of planning optimization. They laughed. Isn’t this a kids game? 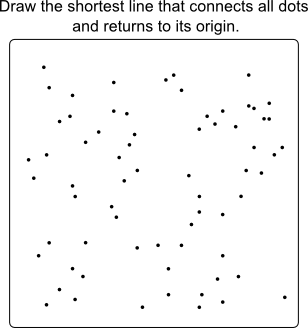 Yes, except that the dots are not numbered and you’re not looking for Mickey Mouse. Calculating a trip’s distance on paper is not practical, so they recreated their trips in the TSP example in OptaPlanner examples (only since 6.3.0.Beta1) to calculate the distance automatically. You can try this assignment yourself: right-click in the example’s UI to manually create a trip. 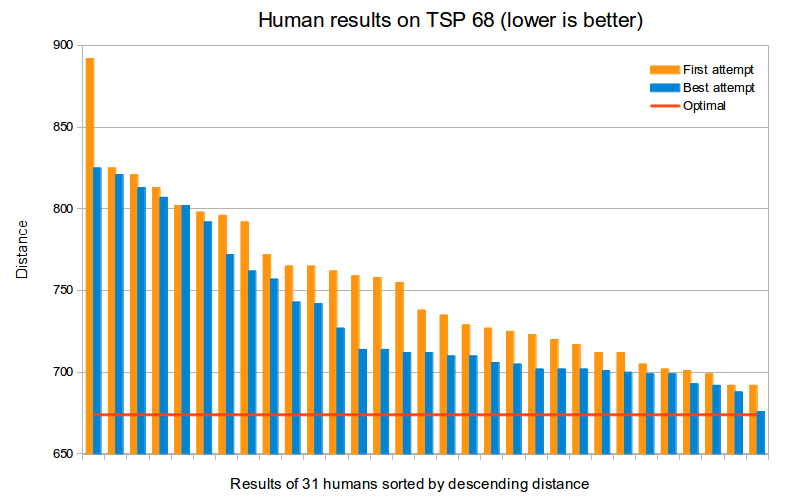 On average, a human’s best result was 9% worse than the optimal solution. That means it roughly takes 9% more time and 9% more fuel to visit those locations. That’s expensive. That’s just on a small problem with only 1 constraint! In the real world, other constraints need to be taken into account, such as vehicle capacity, real road networks and custom business constraints. All of these make it harder. The best attempt of the best human was only 0.3% worse than optimal. That’s a very nice result. If I recall correctly, he did take longer than 30 minutes to find it. Was this skill or luck (or a combination of both)? The second best human (out of 31 people) was 2% worse than optimal. With automated planning, such as OptaPlanner, we can beat the human results, in far less time. We can also scale to bigger datasets with more constraints. Does this mean we can get rid of the human planner? Do we need a human planner? We still need a human planner: not to search for the best plan, but to define what to search for. A search engine like Google can search the web, but it needs to be told what to look for. Similarly, any automated solver (including OptaPlanner) can optimize a planning, but it needs to be told what to optimize for. In a non-trivial enterprise, defining what the business wants/needs to optimize, is not a simple task. It involves talking to the business departments and iteratively tweaking those constraints. We still need a human to that. And as the business changes (market changes, labor regulations changes, …​) those constraints will change too. Again, we need a human to watch over the planner. We also need someone to input the data and validate the results. Furthermore, the human needs to stay in control. But ask yourself: Who of these 2 contenders will win a knowledge quiz? Similarly, who do you want to optimize the planning in your organization? Someone with or without automated planning assistance?